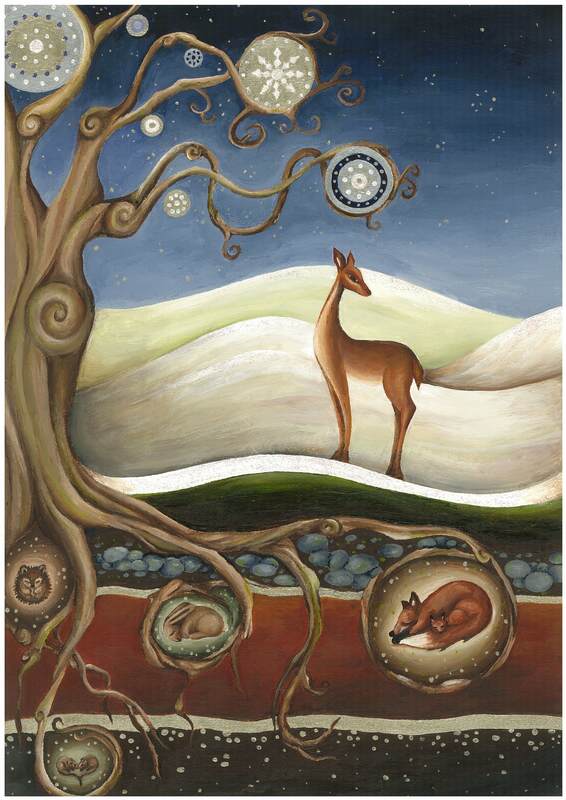 December Solstice – Merry Winter! The December solstice will occur at 5:30 am GMT on Thursday, December 22nd 2011. The December solstice is also known as the winter solstice in the northern hemisphere and the summer solstice in the southern hemisphere. Many of the customs associated with the December solstice, and other northern hemisphere mid-winter festivals such as Santa Lucia’s Day, Saturnalia, Hanukkah, Christmas, New Year’s Day and Twelfth Night all derive from stories of a mighty battle between the dark and the light, which is won, naturally, by the light. Other traditions acknowledge and celebrate this as the time a savior, the Sun-Child, born to a virgin mother. The world’s cultural and religious traditions are so much intertwined! Saturnalia, celebrated by the Romans from December 17th to December 24th with a festival called during which all work was put aside in favor of feasting and gambling. The social order was reversed; masters waited on their slaves. Saturnalia is named after Saturn, who is often depicted with a sickle like the figures of Death or Old Father Time. Astrologically speaking, Saturn is saturnine: gloomy, old, dutiful and heavy. He was the god who ate his own children rather than let them surpass him. For new life to flourish, for the sun to rise again, it is necessary to vanquish this gloomy old fellow. Therefore, the feasting and merriment of the mid-winter season were religiously mandated in order to combat the forces of gloom. The day following the Saturnalia, was the Juvenalia (yay for Latin words), a holiday in honor of children who were entertained, feasted and given good luck talismans (amulets). After vanquishing the Old King, it’s time to celebrate the new in the form of children, the New Year’s Baby, the Son of Man. Naturally this is the time of the year at which the birth of Christ is celebrated, since he is also the New King, the Light of the World who brings light. This history of Saturnalia reminds me of Led Zeppelin’s song “The Battle of Evermore”, although the lyrics of which are inspired by “The Lord of the Rings” by J.R.R. Tolkien. I think of it being wrapped up in the December solstice. I also love listening to To Drive the Cold Winter Away by Loreena McKennitt, A Winter Garden: Five Songs For The Season (also by Loreena McKennitt, but out of print) or if you don’t have access to that CD, there is actually an extended version of this release (with eight additional songs) called A Mid-Winter Night’s Dream, by Loreena McKennitt. All of this is all lovely music for the holidays and winter season. New age and spiritual… it’s just pretty to listen to and it is so appropriate for now and the holidays! Christ’s birthday was not celebrated on December 25th until the 4th century. Before then, December 25th was best known as the birthday of the Persian hero and sun-god, Mithra. The myth tells that he sprang up full-grown from a rock, armed with a knife and carrying a torch. Shepherds watched his miraculous appearance and hurried to greet him with the first fruits of their flocks and their harvests. The cult of Mithra spread all over the Roman Empire. In 274 AD, the Roman emperor Valerian declared December 25th the Birthday of Sol Invictus, the Unconquerable Sun. The union of a virgin and a supernatural force, like the couplings between Zeus and assorted nymphs, was shorthand indicating the presence of a miraculous child, a child with the powers of both worlds. Dionysus is such a child, born of a union between Zeus and Semele. Lenaia was a women-only mid-winter festival honoring Dionysos. According to one reference, on this night, Greek women “held their ecstatic dances in winter — fully clothed in Greek dress, with castanets or the thyrsus, dancing together with no male companions, human or satyr.” Some called it Lenaea, the Festival of Wild Women (a nice companion for the Festival of Merry Women on December 14th). A bull, representing Dionysus, was cut into nine pieces, with one piece being burned and the rest consumed raw by the worshippers. Dionysus was born in winter, crowned with serpents, became a lion in the spring and was sacrificed as a bull (stag or goat) in the summer because these were calendar emblems of the old tripartite year. Some refer to Dionysus as a Year God. Mithra was also associated with the bull (his initiates were baptized with the blood of a sacrificed bull) and shown with the emblems of the zodiac surrounding him, suggesting that he is also a “Year God”. Lenaia occurred on the twelfth day of the Greek lunar month, Gamelion, which falls in early winter. The twelfth day of a lunar month (which begins with the new moon) always falls on a full moon night. If we move this lunar festival to the solar calendar and count from the winter solstice, the festival would occur on January 5th or 6th. This description recalls the Egyptian ceremony re-enacting the birth of Horus, the sun-god to Isis. All lights in the city were doused while Isis circled the sarcophagus seven times, then brought forth Horus who was called “the Light of the World.” Statues of Isis holding the newly born sun god on her lap, presenting him to the world, are similar to pose to later statues representing Mary and Jesus. The return of the light is the most prominent feature of most mid-winter festivals. In Sweden on St. Lucy’s Day, young girls wear white dresses and a wreath of candles and awaken their families with cakes and song. Hanukkah, the Festival of Lights, is celebrated by lighting candles over a span of eight days. The Christian custom of the Advent wreath, with its four candles, one lit each of the Sundays before Christmas, is another way of re-kindling the light. The Christmas candle, a large candle of red or some other bright color decorated with holly or other evergreens, was at one time a popular custom throughout Great Britain, Ireland and Scandinavia. One person, usually the eldest or the head of the household, is designated as the lightbringer. She lights the candle for the first time on Christmas Eve before the festive dinner and during each of the remaining evenings of the Twelve Days of Christmas. To extinguish the candle, she snuffs it with tongs rather than blowing it out, since that would blow the luck away. The candle sheds a blessing on the household and so is protected from accidental quenching. It seems likely that the candle also represented the coming year, just as the weather of each of the twelve days of Christmas foretell the weather of the corresponding month. It had protective or fertilizing powers and was kept as a charm. In Denmark, during a lightning storm, the remnant would be brought out and lit to protect the household. Similar customs once surrounded the Yule log. The Yule log must never be bought but could be received as a gift, found or taken from you own property. Often the log to be burned at midwinter was chosen early in the year and set aside. The Yule log is first brought into the house with great ceremony on Christmas Eve (or the eve of solstice, if one prefers). Usually it is decorated with holly and ivy and other evergreens of the season. Some people prefer to use the Yule log as a decoration and place candles on it instead, thus transforming it into a candelabra like the menorah or the kinara. In Italy, the Yule log is called the Ceppo. Boccaccio in the fourteenth century described a Florentine family gathering about the hearth and pouring a libation of wine upon the glowing wood, then sharing the remaining wine, thus linking the Yule log with the custom of wassailing, pouring out libations to the trees in the orchard. Another ancient midwinter custom is decorating with greens. The Romans decorated with rosemary (ooo… the scent of fresh rosemary), bay, laurel, holly, ivy and mistletoe. (What a lovely combination of scents and beautiful greenery!) The holly and ivy were both important midwinter plants in Great Britain and Ireland, as heard in the lyrics of the mysterious medieval carol which mentions the rivalry between them. This 15th century carol refers to an ancient battle between the two, with the Ivy representing the cold gloominess of winter and the Holly King, the jolly spirit of the season. The history of the Christmas tree has origins based all the way back to the 15th century, although some historians will say it is a more recent tradition. The earliest record of an evergreen being decorated comes from the country of Latvia in 1519, when a group of local merchants carried an evergreen adorned with flowers to the marketplace, where they danced around it and then burned it. Another possible source is the custom in 15th and 16th century Germany of hanging apples on a fir tree as a prop for the miracle play performed on Christmas Eve depicting the Biblical Adam and Eve being driven out of Paradise. You should enjoy yourself as much as possible on the December Solstice because this will bring back the light into the world. Different traditions mention feasting, gambling, playing pranks, giving gifts, visiting, drinking, dressing up, putting on plays and staying up all night… and yes, ummm… fornicating. During the dark of winter, invoke all the forces of pleasure and love which make life worth living. Decorating for this festival is easy since you can use all your Christmas decorations. Evergreens and wreaths represent rebirth and the circle of life. Fill your home with candles and Christmas lights. Place them on mirrors so all of the light reflects, hang up lots of sparkly ornaments and prisms and tinsel so you can create as much light as possible. Oh what fun! Earlier traditions focused on the battle between the dark and the light, but we know both are valuable. Honor the dark before calling in the light. This is the season when animals hibernate and nature sleeps and we can turn inward too. Perhaps some of the depression people feel during the holidays comes from not providing a space for feeling the sadness associated with this season. Set aside time (hard to do amidst the frenzy of the holidays) for sitting in the dark and quiet. I like to spend the entire day of the Winter Solstice in silence and reflection. This is a natural time for letting go and saying farewell. Release your resentments and regrets into the darkness, knowing they will be transformed. Write about them in your journal or write them on slips of paper which you can burn in your Yule fire. Use your holiday cards to make amends to people you’ve hurt or neglected, this is a friendly and healing tradition, and it is, in fact, social networking! I think receiving a card in the mail is lovely, but we all want to save a tree, and save money – mailing cards is expensive! But try, to reach out by mailing holiday cards. It just feels good. It sounds new age-y and spiritual… but, remember, when you light your candles and your fire, do so with the intention of bringing light into the world. What are the ways in which you can help make the world brighter? How do you bring light into the lives of those around you? Make a conscious effort to increase the amount of light you create for yourself and others! Previous Romantic? Cloying? Sweethearts and Their Heartthrobs Connect… No Matter Where They Are Next Here Comes The New Year!